New Earth Tarot Handbook, signed by author, Kate Silver, 332 pages, full-colored illustrated. 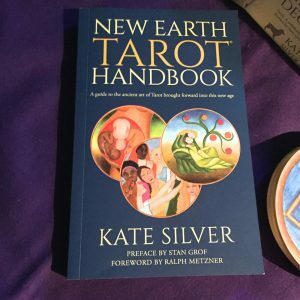 The New Earth Tarot Handbook will help deepen the user’s understanding of the New Earth Tarot Deck through rich commentary, specific image references, and archetypal explanations coming directly from the artist/deck co-creator Kate Silver. 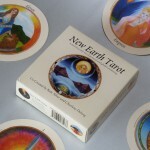 “A special tarot deck is like a precious friend, something to be treasured and celebrated. 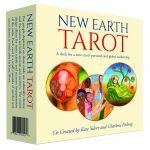 For me, Kate Silver’s “New Earth Tarot” deck (co-created with Charlene Delong) is such a deck. The delightful images and Kate’s rich helpful Handbook commentary clearly comes from a woman with a wise heart who has integrated all of the best forms of knowledge and awareness that are available to the modern seeker. This wisdom is offered in a form that has moved beyond the limitations of more traditional decks and comes like a breath of fresh air sent directly from the High Priestess herself. 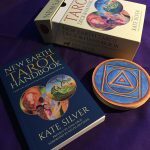 It is sure to be a helpful guide and ally to all those who are fortunate enough to open to its friendly embrace.” —Matthew Stelzner, professional astrologer.